If you've followed my blog for a while, you know that I very rarely have guest posts. In fact, there's only been one other guest post since I began this blog back in 2013. Why? Because I'm a person, not a company. 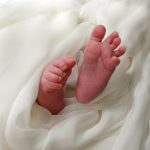 This blog is my voice, and I love the direct connection I have with you as my readers. Sometimes though, there's a post I want written that I'm not qualified to write. I don't personally wear makeup, yet I know many of you wear it every day. Non-toxic skincare is an important component in autoimmune health, and makeup often contains some of the most toxic ingredients. 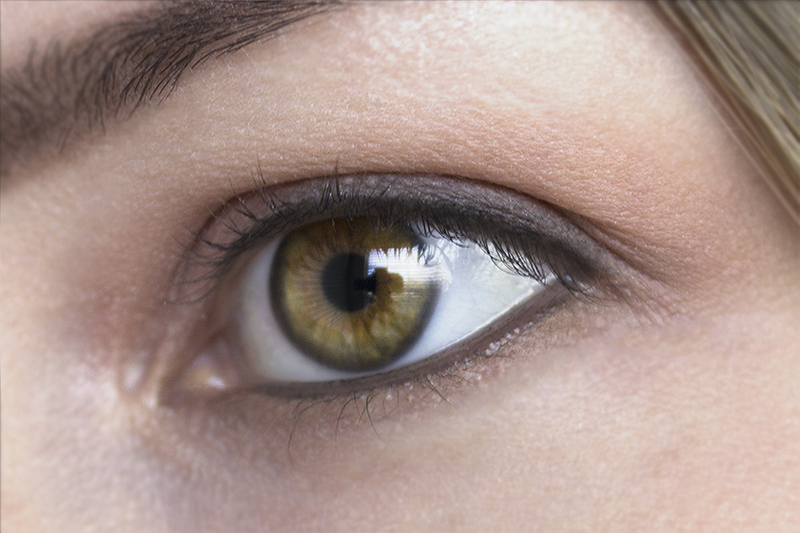 Our skin actually absorbs what we put on it, so this matters. When I learned about Araza Natural Beauty, I was so excited for our community. Truly natural makeup is rare, and it often has a reputation for not working well. 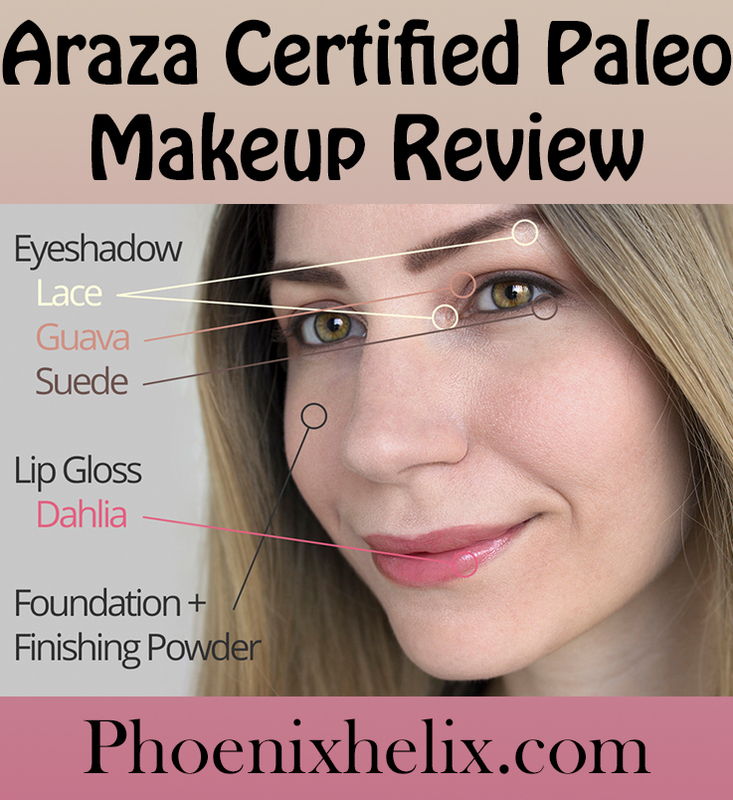 Araza created makeup with certified paleo ingredients (rather than simply “less toxic” chemicals). Their reputation is also excellent, but I wanted someone knowledgeable to test their products, to be sure. Christina Feindel has autoimmune disease herself and is the blogger behind A Clean Plate. In addition to creating paleo AIP recipes and meal plans, she's also a former makeup artist. She is the perfect person to write this review, and her standards are high. 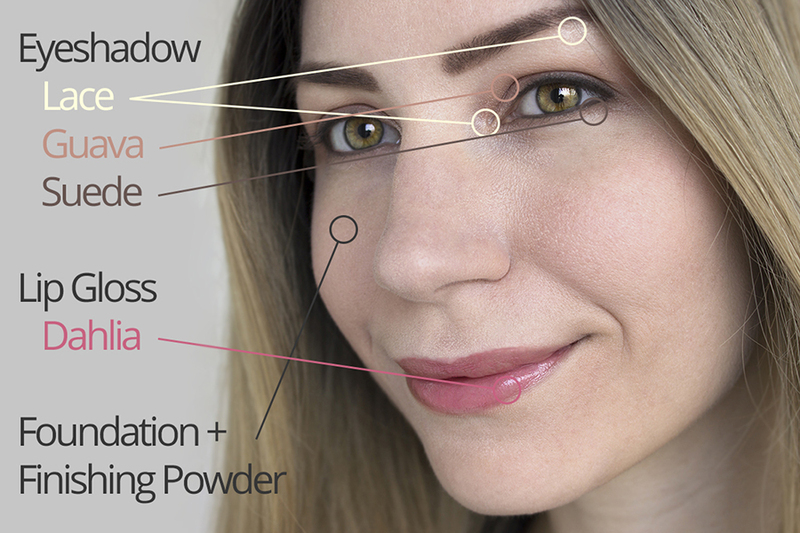 All-natural beauty products have come a long way in recent years. Once the reserve of obscure online retailers and do-it-yourselfers on Etsy, organic and eco-friendly brands now line the shelves of Sephora and Walmart alike – making them accessible to just about everyone. But a lot of them still aren’t that kind to sensitive skin. As a former makeup artist, I’ve sampled products from just about every brand you can name – yes, even the organic ones – and most of them left my skin red, itchy, or broken out by the end of the day. I’ve been glutened by lipstick and forced to flush my eyes of eyeshadow that made them burn. But now there’s a paleo-certified beauty brand that understands what that’s like. 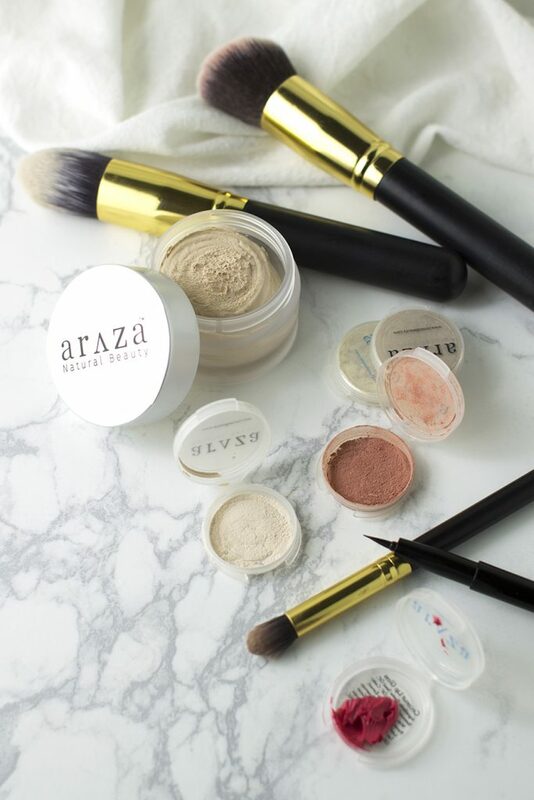 Araza Natural Beauty was founded by two sisters with celiac disease and their products are not only organic, but free of gluten, dairy, legumes, and all artificial colorants and preservatives. In addition to staples like foundation, eyeshadow, eyeliner, lip gloss, and blush, they offer things like treatment masks, bronzer, hydrating mist, brushes, and kits with everything you’d need to get started. 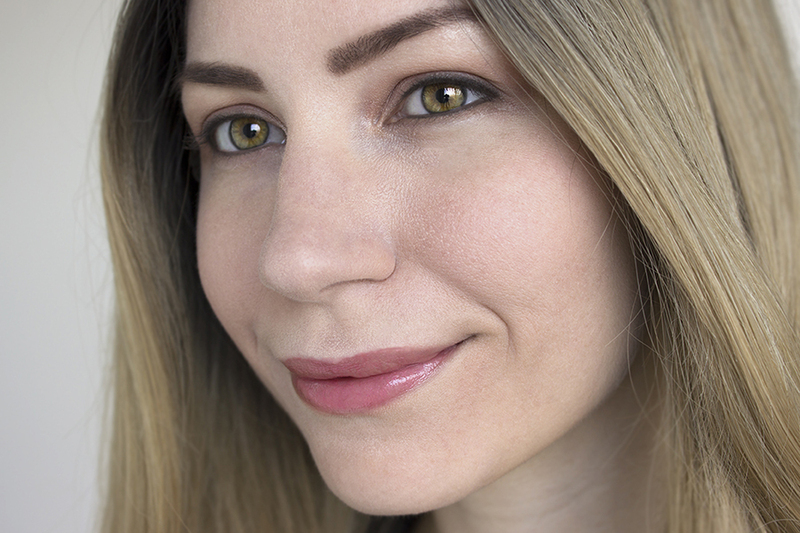 For this review, I chose a few products for a bright, natural spring look. 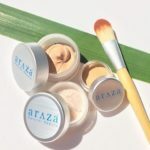 Made of coconut oil extract, beeswax, argan oil, vitamin E oil, clay, and a few other oils and extracts, Araza’s foundation offers 28 SPF and even includes probiotics. It’s a rich cream that should be applied with a brush in a thin layer to avoid feeling caked-on. It provides great, even coverage for mild redness and faint blemishes, but may need to be supplemented with concealer for things like dark circles and actual pimples. To set it, Araza offers a fine, unpigmented powder made of arrowroot and clay, which can be applied with a powder brush. Good foundation is a godsend, but my favorite product was the lip gloss. It glides on with perfect shine and is made of coconut oil extract, castor seed oil, beeswax, vitamin E oil, and a handful of plant extracts for color. Each one smells faintly of raspberry, but is actually flavorless. For dry lips like mine, the oils are welcome, much-needed moisturizers. It has good staying power, but may need to be reapplied after meals. The color I chose, Dahlia, is a bright, sunny pink guaranteed to liven up any look. Now for the eyeshadow. Warm, shimmery white Lace made for subtle highlights on my brow and inner corners, while matte Guava provided good coverage and a toasty rose color across my eyelids. I tried to use Suede for a smokey eye, but the effect was subtle. It blends so well into the guava and surrounding foundation you can’t really tell where it is anymore. I probably needed a darker color for a true smokey eye, but wound up with a soft, warm everyday look. I completed it with my own mascara, eyeliner, and brow pencil. So, does my skin actually feel healthier or more radiant? Well, I got to indulge myself in my makeup obsession without having to wash everything off within an hour of applying it. I wore this look all day without doing any touch-ups except to blot a bit of oil off my face as the day got warmer. And my skin didn’t freak out, break out, or dry up. I’m calling that a win. 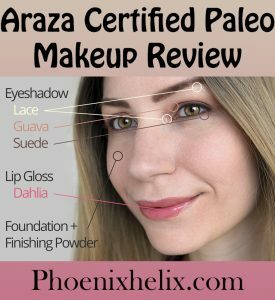 But perhaps what I love most about Araza Natural Beauty is that their website includes everything you might want to know about them. Not only product information like color guides, SPF, and application tips, but detailed information about the purpose of each and every ingredient in the product – so you don’t have to wonder what you’re putting on your skin. 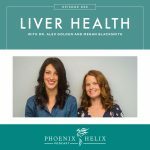 They’re a company that truly believes in their paleo principles and wants to deliver the best possible product for your health. Prices range from $2.50 for sample sizes to $42 for full-size foundation. The photo at the top of the post shows a full-size foundation and sample sizes of the eyeshadow, lip gloss, and finishing powder. Update ~ The Giveaway Has Ended. The winner was Brooks Thoman. Thanks for playing, everyone! If you didn't win, don't despair. 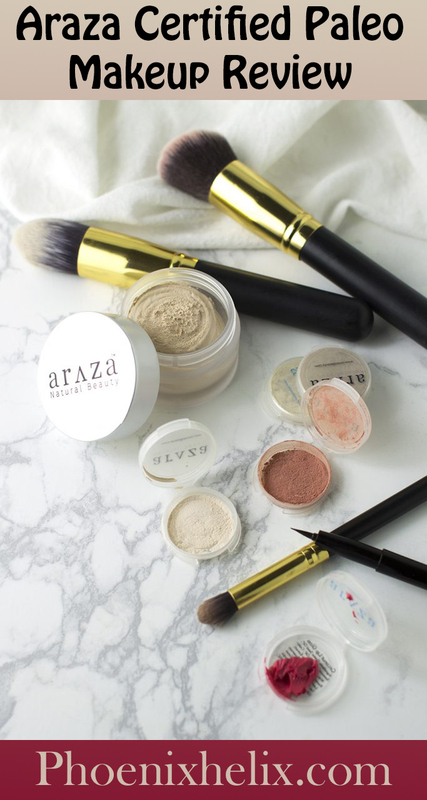 Araza has sample sizes of all of their products. Would you like to try Araza for yourself? They've been kind enough to donate a Fresh Face Complete Starter Set to one lucky winner in the USA. Entering to win is easy. In the the Rafflecopter box below: (1) Confirm that you live in the USA. (2) Visit Araza's website to see their full selection. That’s it! If you want to follow me on Facebook, Instagram, iTunes, Pinterest, and/or Email, you’ll get all of my tips for autoimmune healing. But it’s not required at all. Good luck! The winners will be randomly chosen on April 20, 2018. Here's what's included in the set: Your color choice of 7-1 Coconut Creme Foundation, Green Tea Creme Concealer/Highlighter, Organic Arrowroot & Natural Clay Finishing Powder, and a Flat Top Blending Brush (perfect for applying the foundation).